Rowan Lear and Angela Jerardi, Cowhouse Studios artists-in-residence visitors to Hollywood forest, November 28, 2017. Holly also examining fungi in Hollywood forest, 28 Nov. 2017. Last November, I was delighted to have a visit from two artists-in-residence from the nearby Cowhouse Studios (its around the mountain from Hollywood forest in Co. Wexford). Artist-researchers Rowan (from Scotland) and Angela (USA) had heard about my work and my PhD eco-social art practice research. This is because on the land at the Cowhouse studios there is a conifer plantation and the studio hosts and art educators, Rosie O’Gorman and Frank Abruzzese, had, unknown to me, been aware of my ongoing efforts. It was a dry cold day and Holly and all at Hollywood forest were excited to have visitors! Autumn is a quiet time in Hollywood forest; the native trees are leafless, the conifers seem dark and the birds are quiet or have migrated to warmer climates. Instead we were all fascinated by the fungal rings that link tree-to-tree across Hollywood forest’s floor – Rowan and Angela had been reading Anna Tsing’s The Mushroom at the End of the World (as part of an NCAD (National College of Art & Design Ireland) class that was been hosted at Cowhouse!) and I shared my enthusiasm for Paul Stamet’s mycology work and Sue Simard’s science research on how forests, much more sophisticated than most of us ever knew, depend and thrive as a social community via fungal networks (which I have blogged about previously here). 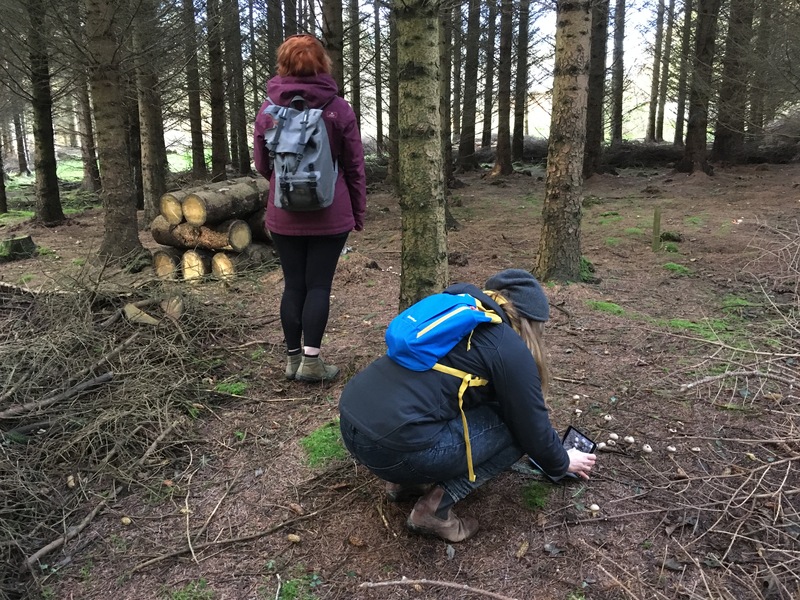 In particular, Rowan and Angela were both interested in learning about how ecology might intersect with contemporary art practice. In this, I found myself easily sharing information, ideas, texts from both my ongoing practice at Hollywood forest (since 2008) but also from my recent art practice PhD in which I have developed a guiding theory-method framework that helps characterise and clarify the main activities of developing and maintaining long-term eco-social art practices. Rowan and Angela must have found Hollywood forest and my practice of interest as I have since found myself unexpectedly invited as one of the facilitators at the Cowhouse Studio’s 2018 How to Flatten a Mountain artists residency. I feel honoured to be taking part – and its refreshing and important that interest in the art and ecology field is growing (the extreme weather in Ireland and elsewhere recently, the growing awareness and outrage of oceanic pollution which has been spread via social media, ongoing reports of warming and rising seas not to mention unprecedented rates of species loss are all becoming harder to ignore). However, bringing ecological understanding into an art arena challenges many of the conventions we have of artistic practice. I will be speaking to these ideas and leading a day-long workshop during one of the days during the 12 day residency. I will be offering an ecoliteracy toolbox of sorts: comprising ideas from science, environmental philosophy, and examples from effective and established eco-social art practices. The aim is to help the artists reflect on how they might more accurately read the environmental realities here during their residency, but also to equip the artists with new ways of thinking for their own home places, so they can create informed and engaging responses for their audiences. Artistic reflection and translation of eco-social concerns are a crucial and still under-acknowledged important response to the ecological emergency. Sadly, widespread ecoliteracy education is not yet mainstream in art education (Ireland lacks cultural policy in this area). However, subjective responses to the ecological emergency, expressed through experiential encounters and translated through artistic practices, have been confirmed as promoting life-affirming values to engage audiences. Across the world, the cultural sector needs to be aware that it has a key role to help societies move toward more life-sustaining directions; decades of dry complex scientific facts and politics have failed to inspire the scale of societal change needed, although all avenues are needed. At its centre, the ecological emergency asks urgent, difficult but vital questions, of how we are living; for ourselves, our neighbours (which must encompass safeguarding our nonhuman neighbours) and for future generations. Ecoliteracy is all about understanding that the ecological emergency is a crisis of Western industrial culture. Its a big topic but creative responses across our communities can help us imagine how we can live differently, how we can live well and justly on this beautiful and finite Earth. See more about the annual Cowhouse How to Flatten A Mountain residency here. My heartfelt thanks to Rowan and Angela! Also to Frank and Rosie for this exciting invitation. Sadly, Rowan and Angela were some of the last people to spend time with Holly, our beloved dog and key partner in our Hollywood forest adventures. She gave her name to the project and no rabbit ever nibbled any young tree with Holly around! She passed away in early December 2017. With us for 13 years, she has left a huge hole in our hearts and loved Hollywood forest so! I’ll create a page for her memory shortly. Hi Cathy, I would love to join in when your doing a workshop day. I would love to relate my art work more with the environment. I have been skirting around the territory somewhat in my painting and drawings but would like to widen my mindset. Hi Maria, This particular residency is a paid workshop but I will post news of others I might do. Thanks for the interest!